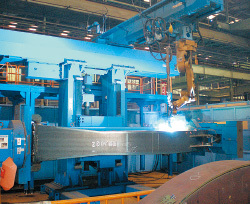 The ARCMANTM contributes to reducing the cost of welding work. 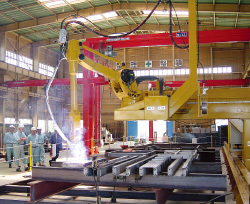 Can perform tandem welding or single welding, thereby maintaining a high operating ratio. 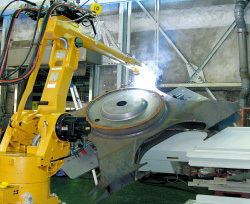 Can perform multi-layer welding in each direction, thereby shortening the welding time. 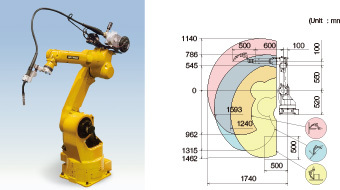 Coordinated movement function enables to work in tandem with the positioner, thereby reducing robot teaching time. 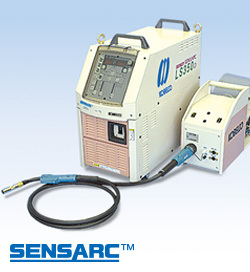 The ARCMANTM improves the quality of welding work. 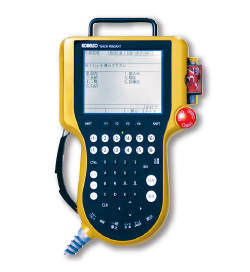 Detects changes in conditions during welding work and compensates for these changes in real time. Equipped with a weaving function that ensures deep weld penetration. Optimal welding conditions can be set for each pass. 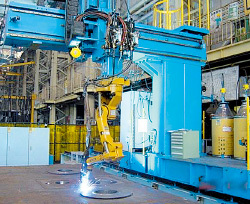 The four manipulators operate in a coordinated manner in order to achieve a significant reduction in welding time. Welding can be performed vertically, thus eliminating the need for positioners and workpiece clamping jigs. Our groove-width tracking function compensates for variations in the groove width during welding and regulates the amount of deposited metal in order to achieve high quality welds. Tracking the groove width reduces the number of sensing points required. 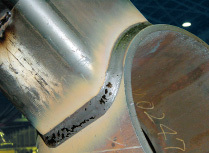 Tandem welding reduces the cycle time by about 40% compared to single welding. Controlling the welding conditions for the leading and trailing wires is easy, and ensures smooth surface weld beads and sufficient weld penetration. 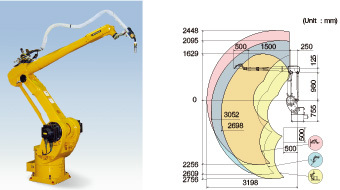 This is a simple configuration featuring a long arm ARCMANTM XL robot without slider. High efficiency is achieved with a drop-axis positioner, which adopts the optimum welding position for inclined welding lines, together with overhead-suspended tandem welding. This reduces the working space and can be used for both small and large assemblies by traversing between the face plates. 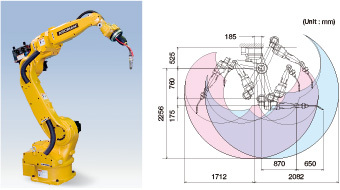 This configuration employs a long arm robot with a compact carriage, which can handle welding of main girders of widths up to 3 m.
Two-dimensional CAD data can be converted to three-dimensional data, and teaching data can be created automatically using proprietary software. 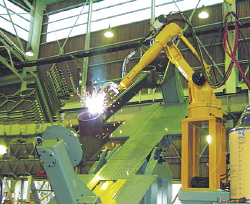 A pair of robots mounted in opposed positions to achieve highly-efficient twin welding. 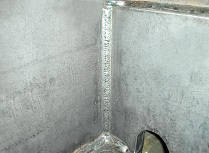 Good-shape weld beads can be achieved even for box welding. 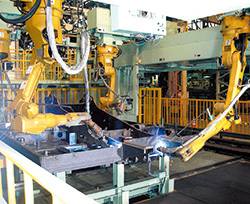 Functions for monitor-less operation enable continuous automatic welding. High quality, good-shaped weld beads can be achieved with three-dimensional welding lines by employing a see-saw type positioner with cooperative control function and groove-width tracking function. 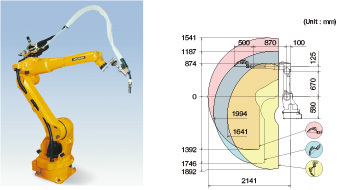 With a drop-axis positioner, the vertical motion axis enable the work position to be set lower. 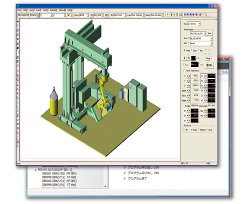 ARCMANTM offline Teaching System can efficiently generate teaching data for complicated assemblies. Utilizing three-dimensional CAD data, ARCMANTM offline Teaching System can easily generate teaching programs for assemblies with particular diversified designs. Our compact tandem torch enables multi-pass welding up to maximum depth of 80 mm, thereby significantly reducing the welding time. This configuration enables higher efficiency operation of a single system though a pair of opposing positioners. 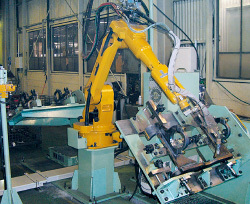 The operator can use the positioners semi-automatically to complete a residual welding line whilst the assembly is mounted on the positioner. 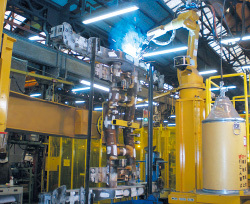 TheARCMANTM improves the quality of weldingwork. 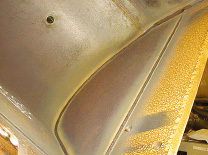 The weaving width and welding speed can be corrected by detecting real time groove width variations. This reduces the sensing points thereby contributing to cycle time reduction. 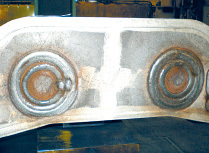 The height of weld reinforcements can be made uniform and the bead width of the cover pass can be regulated. 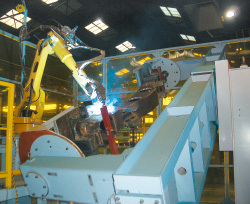 This function uses a laser to gauge the gap and automatically selects the welding conditions from within the data bank. 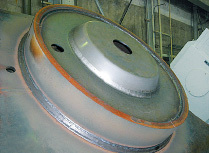 This system selects the lamination technique,determines the wire positioning, and makes the decision on whether or not to weld according to the measured results. This function can be applied for vertical-up welding. This function can be used together with the arc sensor. This function can also be applied to second passes and beyond in multi-pass welding. Up to 499 kinds of welding conditions can be registered. This function operates with the teaching points at the weld start and end only, while the optimum torch angle can be set for each pass. Once the type of groove, plate thickness, or target leg length have been set, this function automatically selects the optimum welding parameters. Welding conditions for the leading and trailing wires can be verified, edited and stored via the data bank screen. The dual arc sensor detects changes in the currents of the leading and trailing wires, adjusts misalignments of the leading wire, and corrects misalignments of the trailing wire, as well as function in the same way when the leading and trailing wires are operated in reverse. This improves the weld quality and reduces the need for repair welding. Since this function performs continuous welding while arc welding is currently being performed, it does not give rise to defects when welding is started or erroneous arc starting. Moreover, since it does away with crater treatment in the middle of arc welding it shortens the time this takes. The multi-pass welding, which intermittently performs round-trip horizontal fillet-welding, improves the bead shape because it disperses the weld-start convexity. This function synchronizes and coordinates the manipulator and positioner, thereby maintaining a constant welding speed and position. 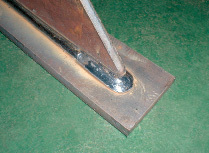 Maintaining the welding groove in the optimal position improves and stabilizes the weld quality. Features two models with enclosed cable. The 1st model with cables enclosed in the upper arm offers the greatest range of motion in its class. 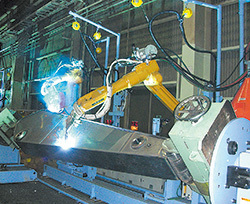 The 2nd model with cables enclosed in the wrist can perform both single and tandem welding by changing the welding torch. 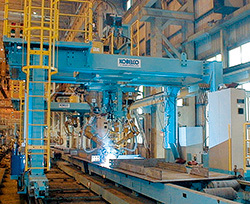 Standard model with state-of-the-art welding technologies. Due to its large size and extensive range of motion, the need for a 1629 slider may be eliminated, or the size of the slider significantly reduced. Compact size to cover an extensive work area in conjunction with slider. This controller controls the manipulator, positioner, and slider that comprise the system. Backlit black and white liquid crystal screen that displays 15 rows × 40 characters. Compatible with English and Chinese. Memory capacity Equivalent to 46000 steps (with 13 axes configuration), No battery backup is required. Function for retrieving data from different work model. Program for production improvement「productivity, weld quality, and takt time」. Help identify possible causes of stop troubles. Automatically records informations of working data. 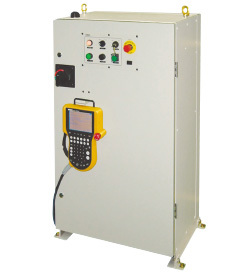 High-performance digitally-controlled welding power source. Suitable for medium to thick plate welding with various welding modes. Digital control makes maintenance easier. Equipped with the extra-low spatter CO2 welding process REGARCTM. Digitally-controlled welding power source featuring extra-low spatter. The spatter emission rate can be as low as one-third of conventional inverter-controlled power sources. 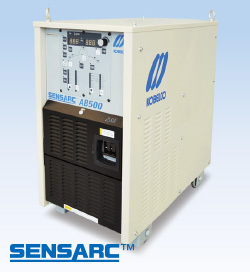 Developed by integrating current- waveform control with digital control. 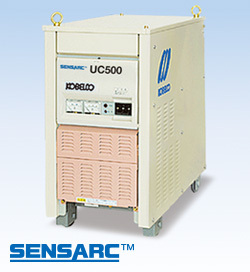 High-performance CO2/MAG welding power source. Unsurpassed performance with instant arc starting. Stable arc in low to high current ranges.